Business tools used to require you to download and run an application on your machine. But now, thanks to continually improving browser technology, things are different. There’s a whole host of products that can be launched in a browser, making it easier to do work across every device you own. And as a result, cloud-based eLearning creation is on the rise. For a comprehensive list of the best course creation options, check out our post on the top 12 eLearning authoring tools. For now, let’s focus on Articulate Rise. We’ll take you through its easy to use functionality and how it can help you create impressive courses, fast. Articulate Rise is a lightweight web application that you can access through an Articulate 360 subscription. You’re not required to download any software and it runs smoothly, on any device, through your browser. This is important as Articulate doesn’t have a Mac version of their flagship product - Storyline. One of the biggest frustrations when using an authoring tool is that responsive courses can be difficult to create. Responsive courses automatically adjust the course content to fit the screen size it’s being viewed on. Rise’s user interface is simple and clean. You can build your content by following a sequence of logical steps. This is really useful if you want a tool that guides you through the process. The options that Rise give you are admittedly more limited than Storyline, but this works in its favor. How can Rise build courses that are truly responsive? It uses a template course creation builder. The structure of each section can be scaled and adapted effectively. Responsive design can be complicated to achieve, so this simplified approach makes it much easier. You simply choose the structure of the course and then input your text and media. Alternatively, you can start from scratch and use ‘blocks’ that allow you to build courses by selecting module types. Rise gives you two routes to creating courses. You can choose pre-built ‘lessons’ for a rapid approach, or custom ‘lessons’ using ‘blocks’ if you’d like more control and customization. Using the individual building blocks you can search through various ‘building blocks’ - each with several permutations. The course presentation is clean and stylish, and most importantly, can be displayed on any device. You’ll still have to make some decisions on what content suits the predominant device for use. For example, if I was creating an online course on how to make bread I’d assume that learners will be using a tablet or mobile device to take the course while they’re in their kitchen. The navigation is adaptable so the learner can move menus out of their way, zoom in and out of images, making interactions feel smooth and precise. The preview function allows you to see how each section of a course will be displayed on each device type - desktop, laptop, tablet, and mobile. We’ve previously written about how important this is to ensure the instructional design choices you make are suitable for the device your content will be displayed on. When building courses in Articulate Rise, I find myself regularly checking small changes, like how much text works best in a paragraph displayed above a video. Like everything else in Rise, exporting content is pretty straightforward. The exporting workflow in other tools can be unnecessarily complicated, so it’s great to see simplicity employed in Rise. There are few basic options listed on a single page. Easy! Here are the choices available. You can choose one option from the following: LMS, PDF, Web. If you choose LMS, a drop down lets you define the specific eLearning format you want to export. SCORM 1.2, SCORM 2004, AICC, or xAPI. These course formats track learner progression in various ways. You can track using course completion, quiz result, or a Storyline block. Then you can define the 'completion' criteria for that course. Is it achieving a minimum score in the quiz or just reaching the end of the course? 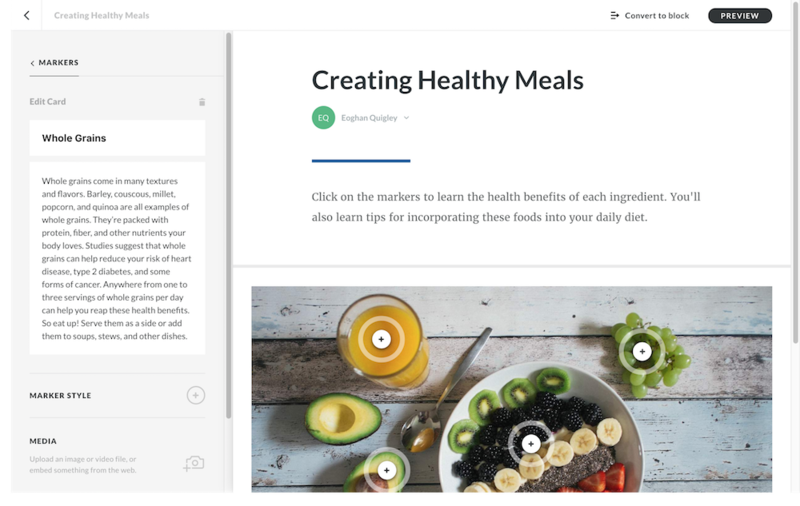 Most of the time you’ll be using the exact same setup for all of your courses so this streamlined menu makes the process easier, and makes your course completion tracking more accurate. Articulate Rise is only available with an Articulate 360 subscription. So if you’re using Rise as your primary tool you’ll also have access to Storyline - a much more capable, albeit complicated, tool. If Rise was a standalone product it may make more sense for those who need it most. You can’t import courses created with Rise into Storyline or vice versa, so your content is siloed in either tool. Articulate Rise is a super, easy to use authoring tool. It’s a plug and play solution, that produces beautiful, fully responsive courses. If you need to quickly create courses that look great and accurately track course completions, Rise should be top of your list.